The data collected by the chemical/physical monitoring programs is stored in both national and state databases, click below for a description and link to each database. Mapping tools are also available to allow users to view data spatially. Users can also learn more about reports produced using data from chemical/physical monitoring efforts. The National Water Quality Portal is a cooperative service sponsored by the National Water Quality Monitoring Council, the US Environmental Protection Agency (EPA) and the US Geological Survey (USGS). It serves data collected by over 400 state, federal, tribal and local agencies. Data is acquired from EPA’s STORET data warehouse, USGS’ NWIS database and the USDA ARS STEWARDS database system. Data from BFBM’s chemical/physical monitoring programs is housed on either the NWIS or STORET databases (descriptions of both can be found below). Therefore, the National Water Quality Portal should be used to retrieve a complete data set. 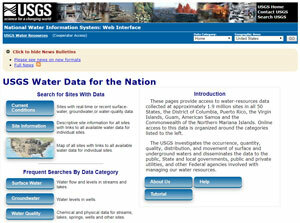 National Water Information System, is a national database maintained by the United States Geological Survey which houses chemical/physical data for streams, lakes and groundwater in addition to surface water flow, water levels in streams and lakes, and ground water levels in wells. Data from the cooperative BFBM-USGS Ambient Surface Water Monitoring Network, can be retrieved here in addition to the National Water Quality Portal. 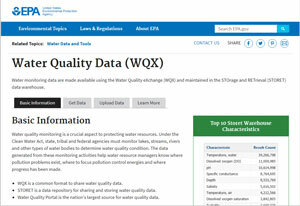 Formerly known as STORET, the Water Quality Exchange, is EPA’s repository for water quality, biological, and physical data. 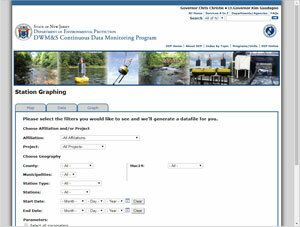 Also included in this data warehouse are water quality habitat, metrics and indices. Data from BFBM’s chemical/physical monitoring programs excluding New Jersey's Ambient Surface Water Monitoring Network can be downloaded through here in addition to the National Water Quality Portal. 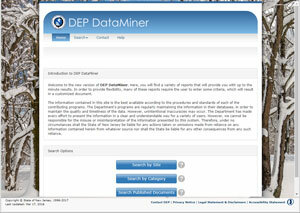 DEP-DataMiner produces customized documents based on a set of criteria that users enter. Visitors can use DataMiner to search the NJDEP’s Water Quality Data Exchange system for data and view results based on monitoring locations, parameters, and/or a beginning and end date. This information can be found by selecting the “Ambient Water Quality” option under Report Category. 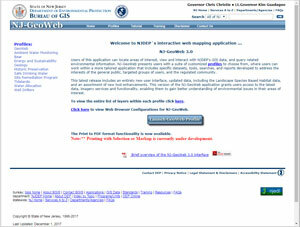 DEP´s interactive web mapping application, NJ-Geoweb users can view water quality data related to sampling locations on the map. Users can search data by county/municipality and watershed to see chemical (along with biological and habitat) results in tables that can be copied and pasted into desktop software programs. Chemical/physical monitoring information can be found under the Ambient Water Monitoring profile. 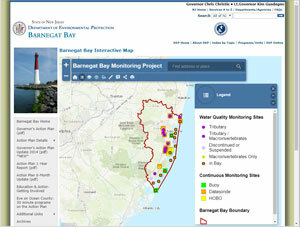 This interactive map displays monitoring locations (both active and nonactive) sampled by BFBM’s chemical/physical program, the Bureau of Marine Water Monitoring, and other partners for the Barnegat Bay monitoring program. Clicking on a monitoring location allows users to see the site name, location, and photos of the site. The map can also be used to access chemical/physical data collected during intensive sampling from 2011-2012. Data from the year 2010 to present is made available to the public at the Division of Water Monitoring & Standards Continuous Data Monitoring website. This data, along with more information on the Division-wide effort for continuous monitoring, can be found by clicking the button below. Data prior to 2010 is available through the National Water Quality Portal as summary statistics (minimum value, maximum value, etc.). Please contact the Bureau for full data sets for this older data. NJDEP recently commissioned a USGS study on state wide long-term trends in nutrient loading and other water quality characteristics. This studied utilized water quality data from the cooperative Ambient Surface Water Quality Monitoring Network over a four-decade period (1971-2011). USGS analyzed more than 82,000 data points collected over this time period from a variety of urban, suburban, agricultural and protected areas. The USGS Scientific Investigations Report 2016-5176, Trends in the Quality of Water in New Jersey Streams, Water Years 1971-2011, is available for download here. NJDEP’s Division of Science and Research is responsible for periodic assessments of environmental conditions using measures or indicators of environmental health. To view the Surface Water Quality section of the Environmental Trends Report, click here. In accordance with the Clean Water Act, data from monitoring programs is used to assess attainment of the water body’s intended uses in the New Jersey Integrated Water Quality Assessment Report (305(b) and 303(d)). The 305(b) report gives the status of overall water quality and support of designated uses (i.e. recreation and water supply) in the state. The 303(d) list identifies waters that do not meet surface water quality standards. A new report is released after each assessment cycle (every 2 years). The most recent report along with a more detailed explanation can be found here. Additionally, reports from previous recent assessments cycles are available for viewing and download under the “previous assessments” tab. Also included here are historic assessment reports dating back to 1975. The Bureau of Environmental Analysis, Restoration and Standards is responsible for New Jersey’s Surface Water Quality Standards. These standards establish designated uses, classify streams based on uses, designate antidegradation categories, and develop water quality criteria to protect those uses.